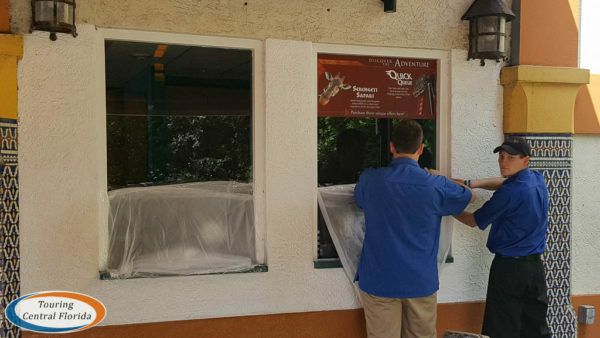 As Hurricane Irma continues to move towards Florida, Busch Gardens Tampa Bay has been making preparations to keep the wildlife, ambassadors and park property safe from the storm. 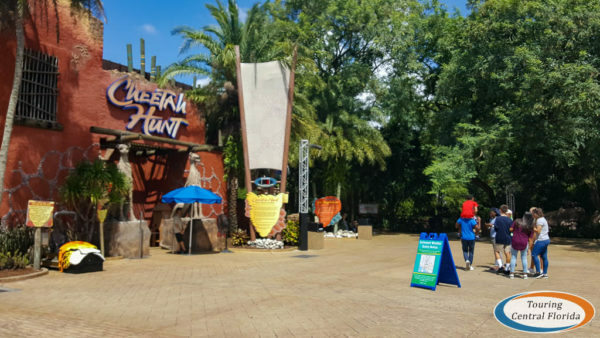 Both Busch Gardens Tampa Bay and Adventure Island will be closed Saturday, September 9th through Monday, September 11th. 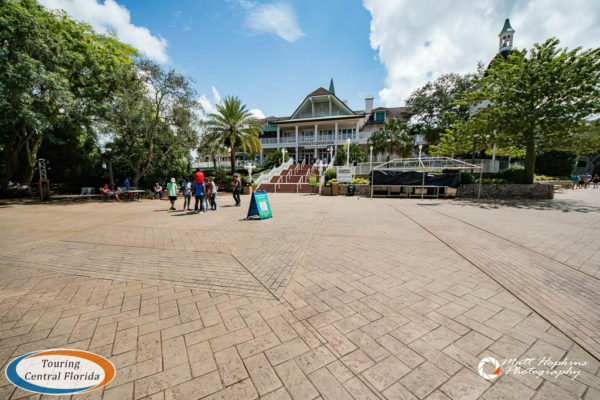 (Adventure Island is back to weekend only operation, so would have been closed Monday anyway). 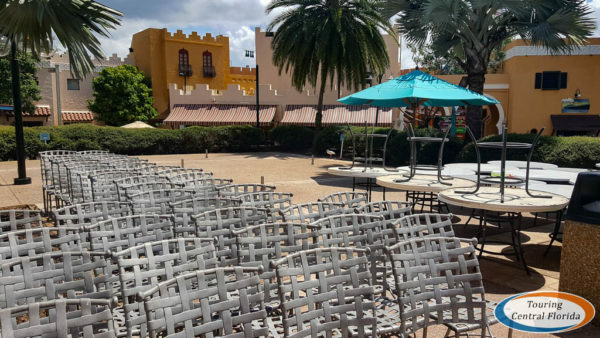 This extended closure follows Busch Gardens Tampa Bay first announcing it would close one hour early on Saturday. At the park Friday, crews were busy getting ready for the impending wind and rain from Hurricane Irma. Despite being a beautiful day, attendance was very light. 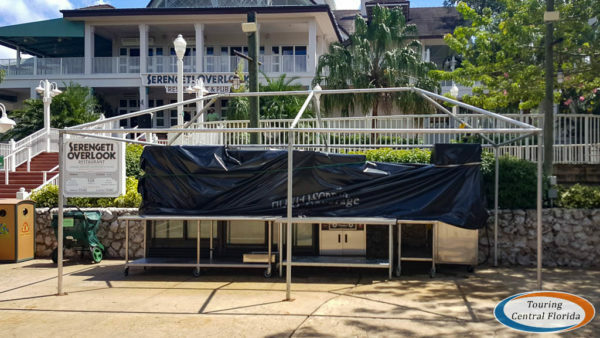 Near the entrance, ambassadors were taping plastic sheeting up around guest services windows to protect from rain being pushed in by high winds. 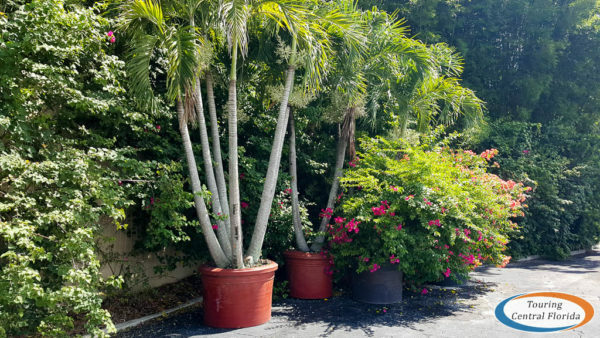 Banners were taken down, and the large potted plants that beautify the area were stacked together in a corner near the tram stop. 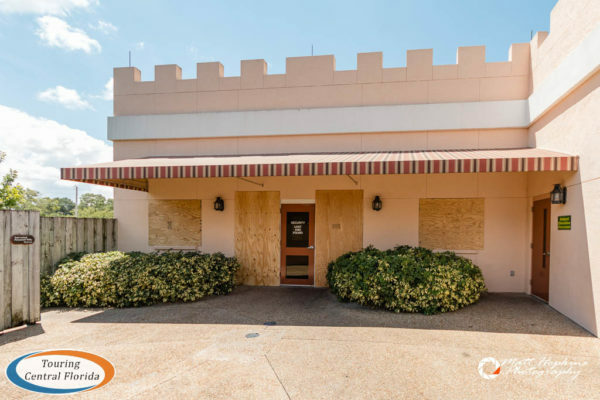 In Morocco, the Security Office was boarded up. 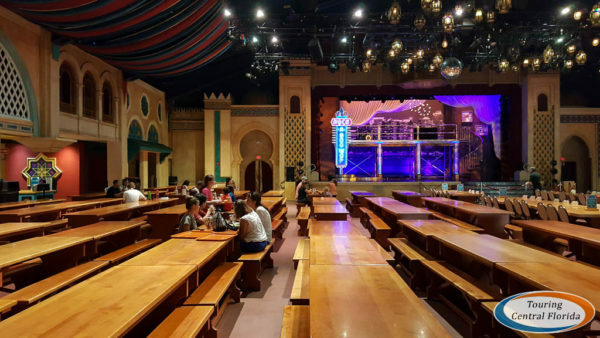 On the terrace of Zagora Cafe, the tables, chairs, and umbrellas were lined up and being moved to a behind the scenes area to wait out the storm. 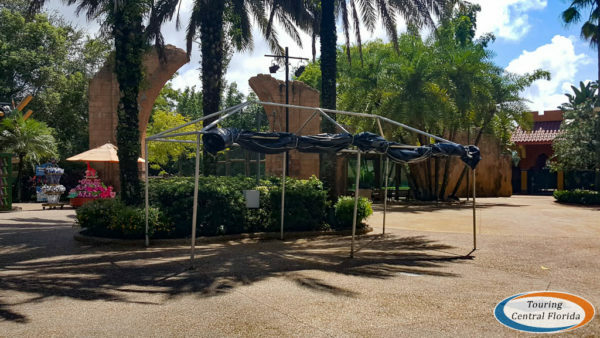 Throughout the park, tents put up for Howl-O-Scream were partially dismantled and equipment covered. 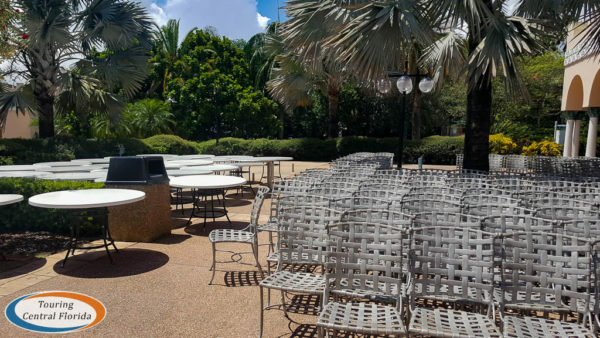 The three DJ booths for the event were also removed from the pathways. 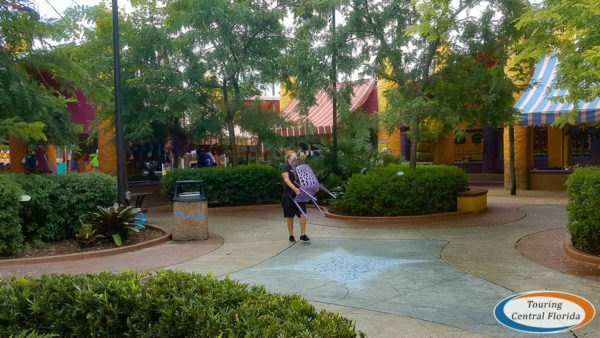 Elsewhere in the park, benches, tables, chairs, umbrellas, signs and other loose items were all being removed or were already gone from the public areas. Where are you putting the Giraffes ?!!!!! 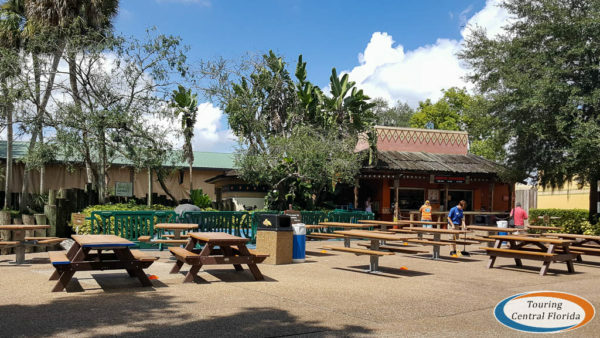 The park has night buildings and other enclosures for all their animals, so they are being sheltered in one of those safe locations. They also have animal care staff on site 24/7 through the storm to keep an eye on them and respond to any issues that may arise. 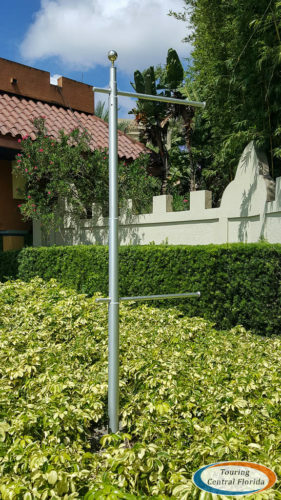 Stay safe while the storm is about.